We’ve been really groovin’ on the caterpillars in a container as the centerpiece for our dining table. I realize this might be strange to some people but it’s normal for us. There’s something wonderful about watching the caterpillars eat their meal as we eat ours. The container doesn’t always have munching caterpillars though. Sometimes it’s still and quiet with hanging chyrsalides. 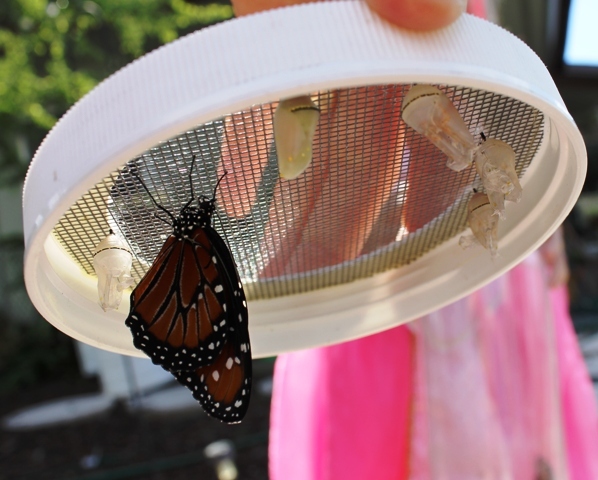 We released the last butterfly that emerged from its chrysalis in our other container. So, we went on a hunt in our yard for new ones. 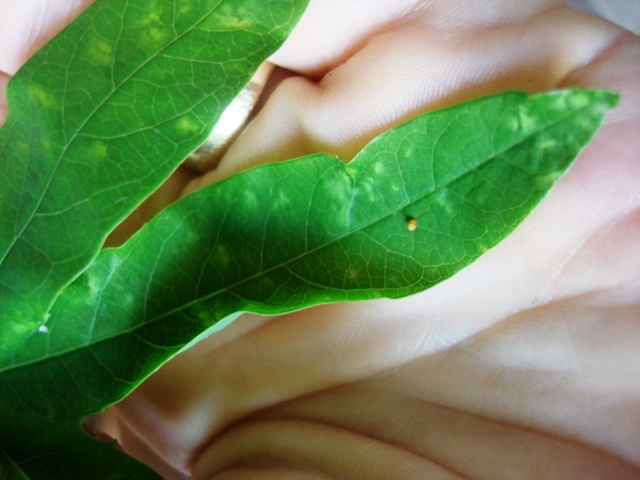 The kids discovered some butterfly eggs on a couple of passion fruit vine leaves. Grayson thinks they’re gulf fritillary eggs. I thought they might be zebra longwings, but we learned they lay their eggs in clusters. The gulf fritillary will only lay a single egg. We will find out soon enough. It’ll be a nice surprise. They’re in our cycle of life centerpiece on the family table. When the eggs hatch, we’ll keep adding fresh passion fruit vine leaves and flowers for them to eat. 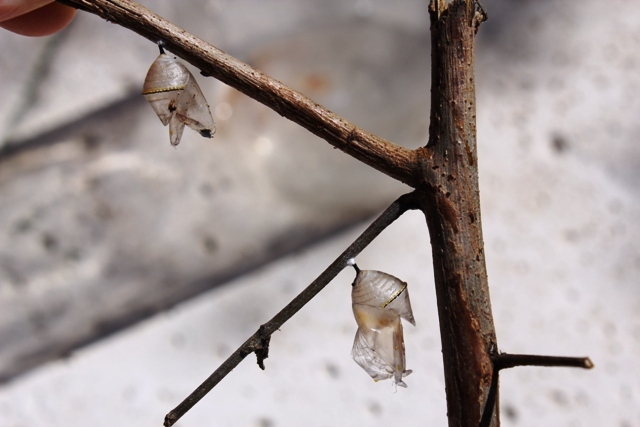 We always add a stick with no leaves into the container for them to form a chrysalis on when they’re ready. A gulf fritillary egg on a passion fruit vine leaf. It's a very tiny yellow dot. The centerpiece at our family table. 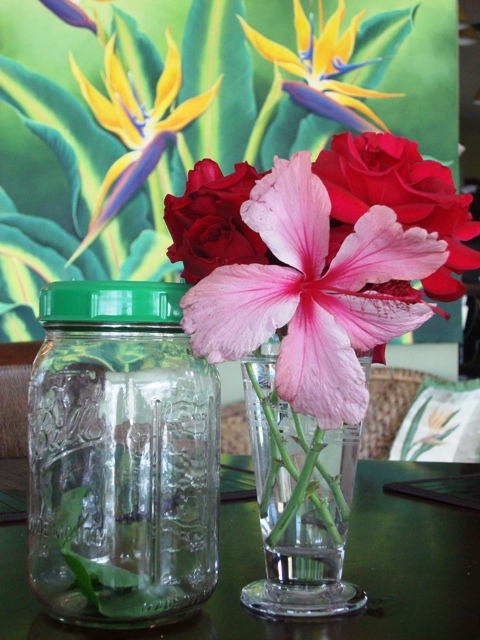 The jar and lid in the picture is usually used for sprouting seeds. It’s not ideal to keep caterpillars in though because they can easily escape. An airtight lid is fine to use for a while because they have plenty of oxygen at this early stage. 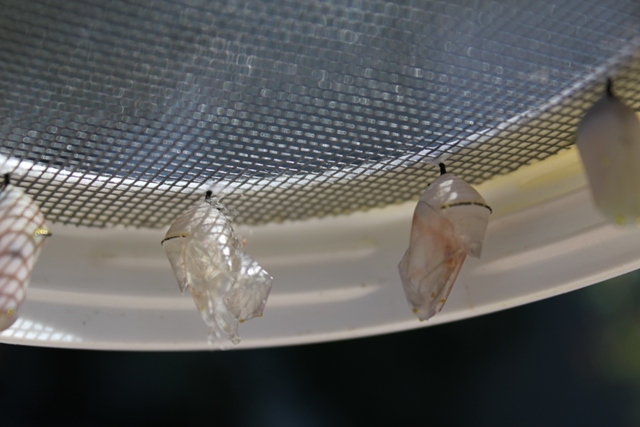 When the eggs hatch, we will move the caterpillars into our favorite plastic container that has a mesh top. Butterflies and caterpillars breathe through holes in the sides of their abdomens that deliver oxygen through a system of tracheae. We’re keeping our eyes peeled for a swallowtail caterpillar. 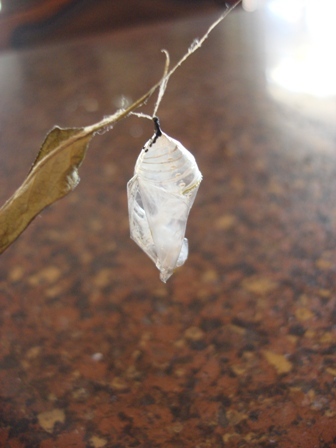 The last monarch butterfly hatched from its chrysalis and Loring took it outside to let it go. 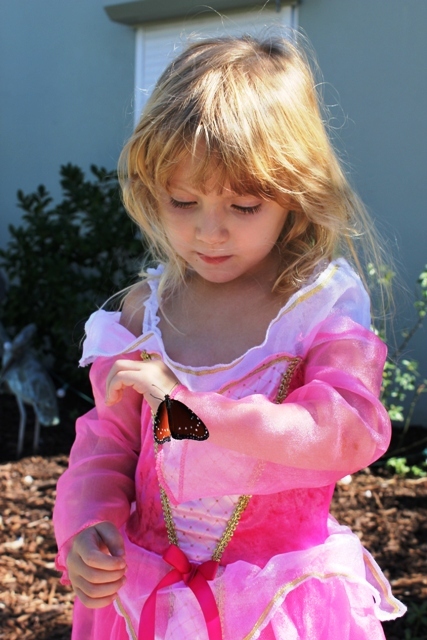 The butterfly took a long time to warm up so she was able to really study it… and she did. Beautiful creatures. They’ve really touched our lives. 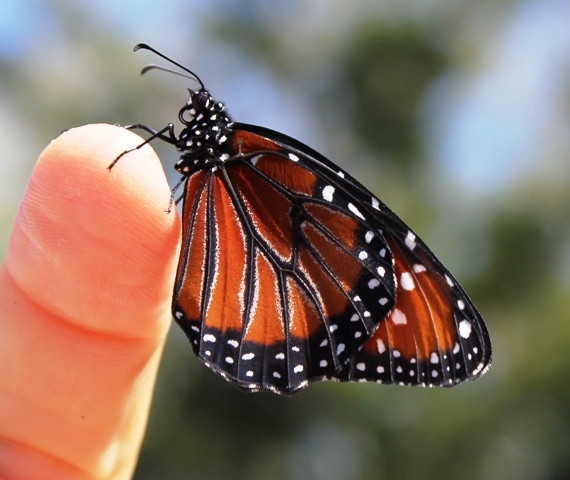 A monarch butterfly getting ready to emerge from its chrysalis. It’s drying off and warming up. Did you know that fabric softeners cause a halo that butterflies (and other insects) can see? They won’t come near you. I wonder if it works for mosquitos. Loring studying her mariposa. She calls herself "sleeping Loring" in this outfit. Her own design. Loring's prince is always around. It's a daily thing for her to go find him. 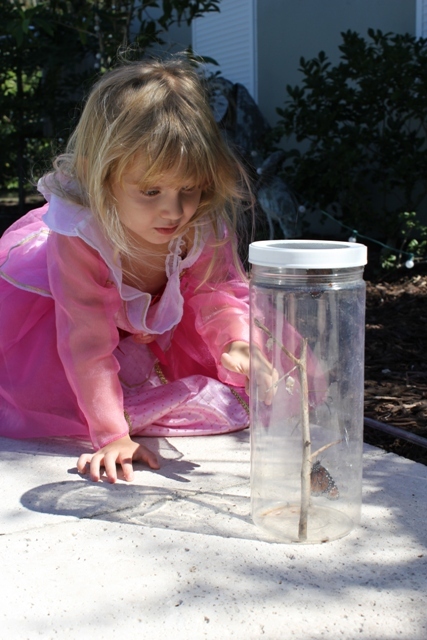 We’re going on a hunt in our yard tomorrow to find some more caterpillars to start our cycle of life container again. We’re hoping to find a swallowtail. 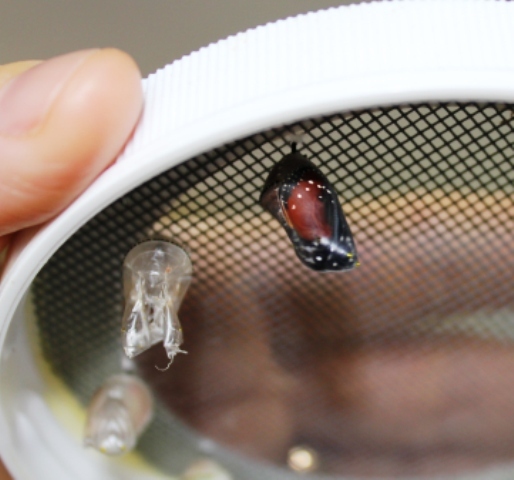 Two more butterflies emerged from their chrysalides this morning inside our container. We were able to watch it happen from start to finish. 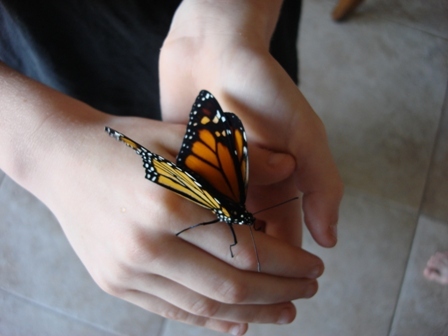 First, the butterfly cracked open its cocoon and poked its head out. Then, it flipped its body out. The wings were still all folded up, crumpled and wet. It gently rocked back and forth, probably to help dry its wings. We watched as it slowly unfolded. Amazing! 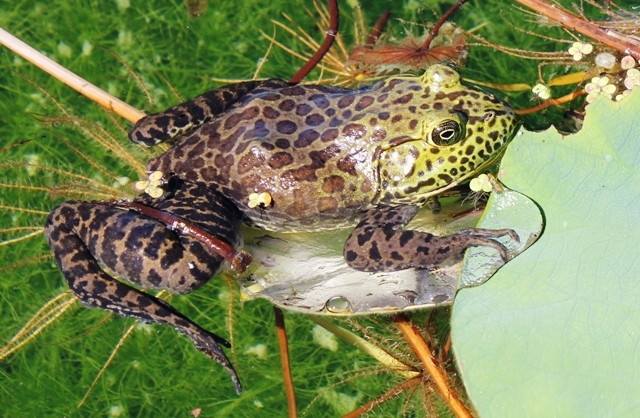 We will never get tired of watching this cycle of life. My absolute favorite butterfly book is the Family Butterfly Book by Rick Mikula. I have used this book many, many times over the years. It has some great container ideas that are super easy to do. Our cycle of life container. Chyrsalides and butterfly on the inside of the lid. 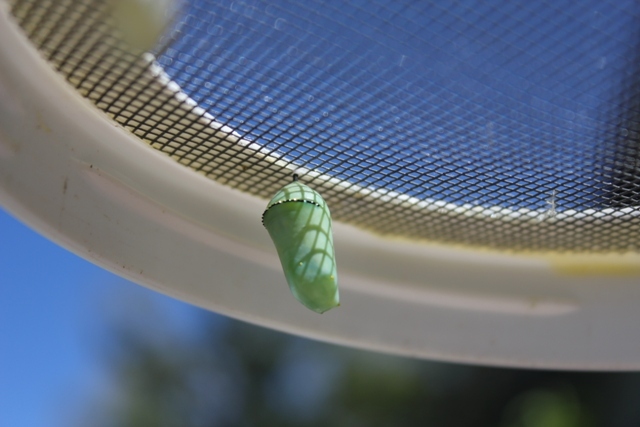 Monarch butterfly chrysalis on the lid. Empty chrysalides on the stick that was inside the container. 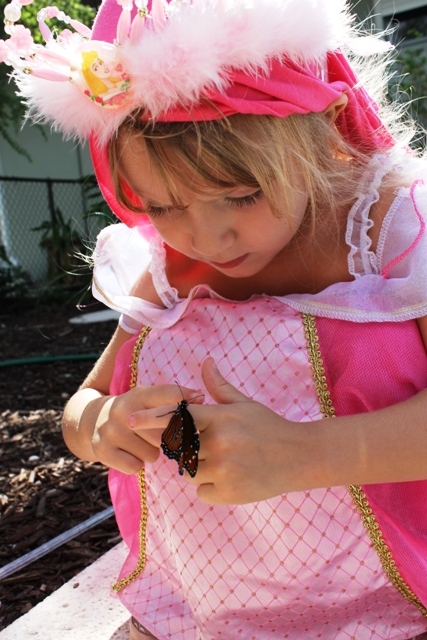 I wonder which princess will show up to do tomorrow's butterfly release? I’ve taken a forced vacation from my blog for a couple of weeks due to computer problems. We haven’t left our yard much though and we’ve been busy with our animals, gardening and lots of homeschooling. 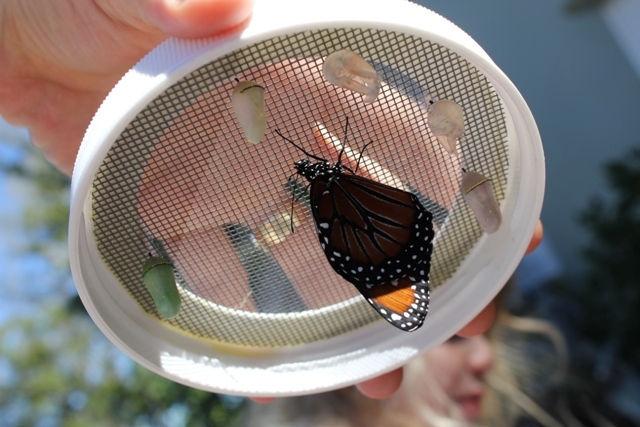 The kids collected 8 monarch caterpillars last week and put them in a container with lots of scarlet milkweed. The caterpillars chomped right through the milkweed quickly, so we just kept adding fresh plants every day. 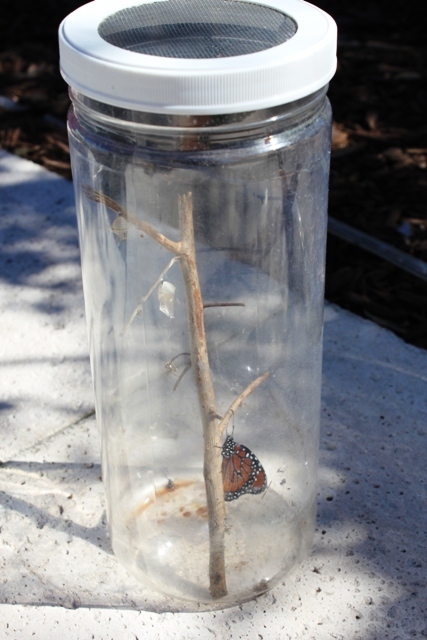 We added a stick with no leaves inside the container so the caterpillars would have a place to form their chrysalides. They did and we’ve had 2 butterflies emerge so far. Our 3-year-old keeps a constant watch over the container which sits on our kitchen table as a centerpiece. 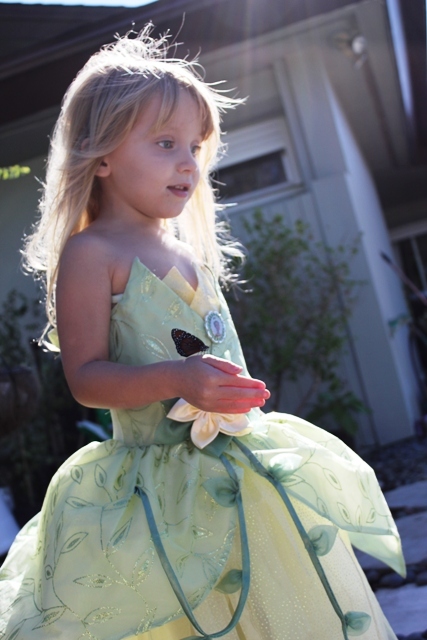 She yells out, “Mariposa’s awake!” whenever a butterfly breaks out of its chyrsalis. She’s always the first one to notice. 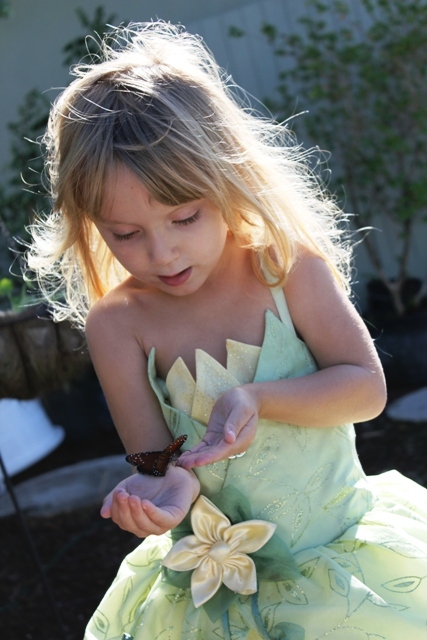 The garden fairy and the butterfly. Don’t these photos make you want to go out and find some caterpillars? It’s been a great centerpiece for our kitchen table. 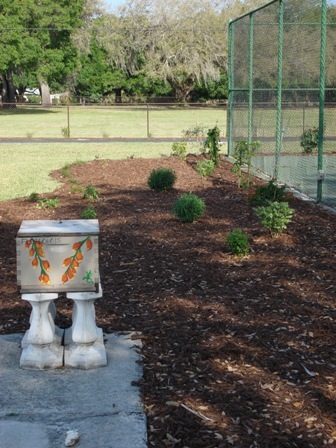 This is our butterfly garden after all the plants have been planted. Most of these plants will grow to their full potential after one growing season and the garden will look full. The trees in the garden will take longer than the vines and shrubs to fill out, however, it is only a short wait. There are two small mimosa plants that will act as a low groundcover and sprawl quickly. Actually, will try to take over. It isn’t necessary to plant more than two in this space. The dune sunflowers, blanket flowers and tickseed will re-seed and spread too. I have about 16 firecracker plants around one edge that will each grow to about 3 feet high and 3 feet wide and create a nice, soft hedge. The vines that I set loose on the chain link sides of the tennis court will grow extremely fast. Our “mariposa garden” will hardly be recognizable as the same garden in about 6 months. Grayson and I did tons of research on the plants as we designed our garden together. We wanted to know the size each of our plants would be when they are mature so that we would plant them in the right spot. We considered the color of the blooms too. We will just have to be patient and enjoy the different stages of growth. The butterflies are already visiting. My three-year-old refers to butterflies as “mariposas”. “Mariposa” means “butterfly” in spanish. 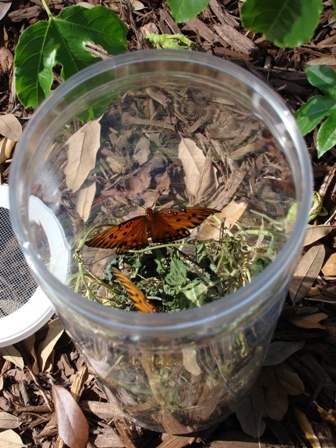 Yesterday she noticed that our gulf fritillary chyrsalides turned into butterflies in our kitchen butterfly habitat and she gleefully yelled, “Mariposa’s awake!” We let the butterflies dry their wings and then we let them go into our newly planted “mariposa garden”. Our butterfly garden is finally finished. It didn’t happen in one afternoon. We spread it out over a couple of weeks. First the sod had to be taken up and then the weed mat was put down. We used landscaping staples around the edges to keep it in place. We used scissors to cut X’s in the weed mat where we planted our collection of butterfly host and nectar plants. 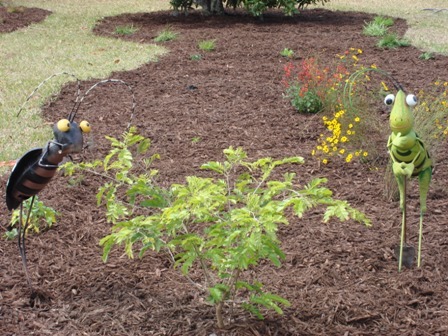 After we planted everything, we put down the mulch. 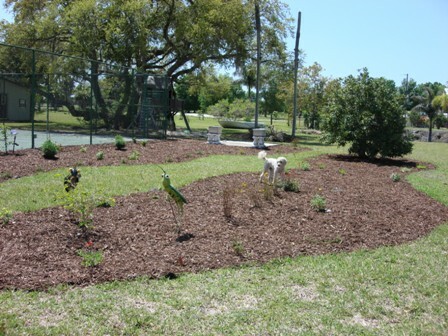 Gulf Coast Palm and Tree Landscape Nursery was a huge help to us. 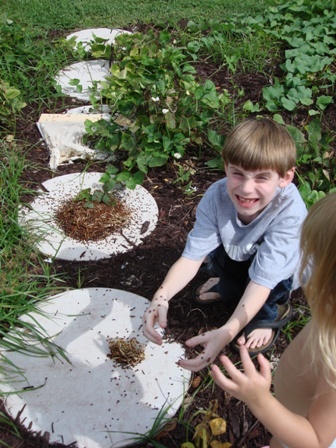 We’ve planted lots of host and nectar plants for many types of butterflies that are found in Southwest Florida. The “after” picture looks a little sparse, but these plants will grow big quickly. The tree is a macadamia nut tree that the bees love. It gives us more macadamia nuts than we can eat. We are able to store them for the entire year. Most butterfly plants prefer full sun. However, the zebra longwing, prefers shade. The zebra longwing is the Florida state butterfly. We planted several passionfruit vines, which is their host plant. We put some of the passionfruit vines in full sun and a couple in the shade. 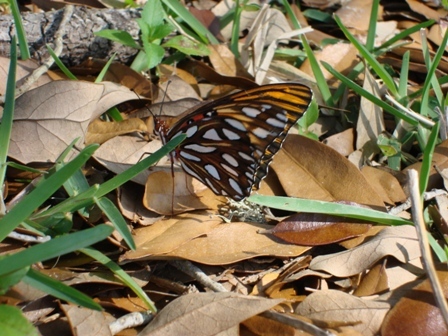 The gulf fritillary also uses the passionfruit vine as their host plant, but they like it in full sun. A host plant is a type of plant that a butterfly will search out to deposit their eggs. Each butterfly species will have their own host plant. A nectar plant will be the plant that attracts, feeds and provides energy to the butterfly. 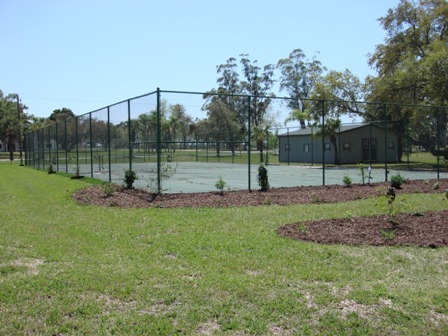 Our butterfly garden borders our tennis court. We planted many, many vines on the court’s fencing to protect the butterflies from rain and wind. Hopefully the vines will provide some shade for the tennis court too. We’ve planted a dutchman’s pipevine, several different types of passionvines, scarlet milkweeds , tropical salvias, necklace pods, a white and pink powderpuff tree, dune sunflowers, lots of firecrackers, firespikes, a Bahama cassia tree, a wild lime tree, several lion’s tails, a sweet almond bush, native wild petunias, a golden dewdrop tree, a sky vine, a Mexican flamevine, several Florida flamevines, coonties, blue-eyed grass, mimosas, green-eyed susans, tall red pentas (dwarfs don’t have nectar), tickseeds, and two coral honeysuckles. Whew…that’s a list. The butterfly garden won’t look sparse for long. 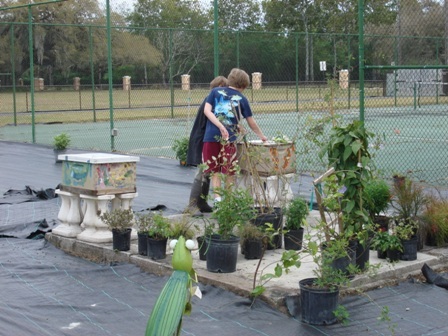 We purchased all our butterfly plants from a local nursery called “Riverland Nursery“. They are extremely knowledgeable about butterfly plants for our area and specialize in providing them. They also hold free classes on the weekends for just about everything garden related. I believe this baby caterpillar is a direct result of the monarch butterflies we released into the garden last week. 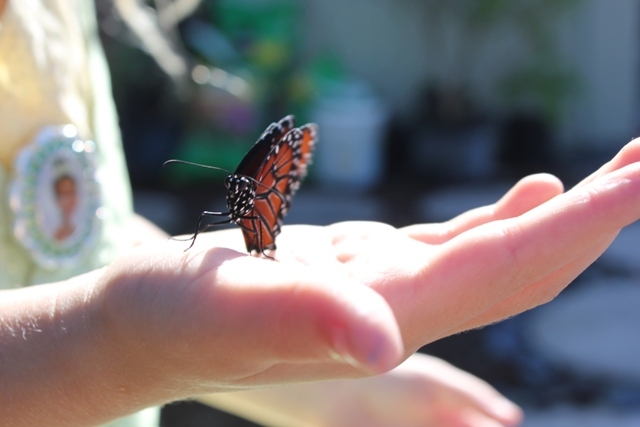 It’s important to never use herbicides or insecticides on a butterfly garden. 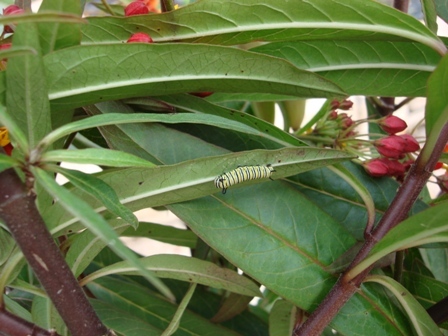 This caterpillar will eat the leaves of the scarlet milkweed which is its host plant. Scarlet milkweeds get red aphids on them. Their purpose is to control the milkweed population. I just squish them because I don’t want them around. Another solution would be to bring some ladybugs into your garden. Make sure you get baby ladybugs because adult ladybug’s will just fly away. They tickle when you release them. 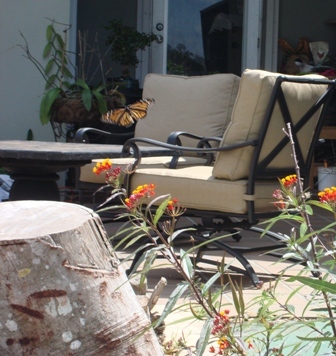 When the monarch caterpillars eat all the leaves off the scarlet milkweed it can be trimmed way back. It will sprout new leaves right away and get bushy just in time for the caterpillars to devour it again. The young caterpillars need the young, tender leaves to eat. 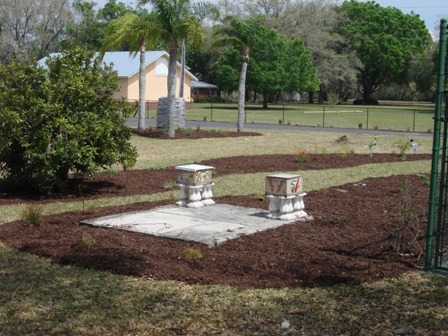 We are looking forward to watching our butterfly garden turn into a mature, full landscape. 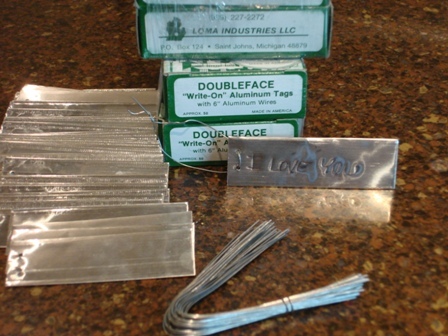 We plan on labeling our plants with our aluminum tags tomorrow. 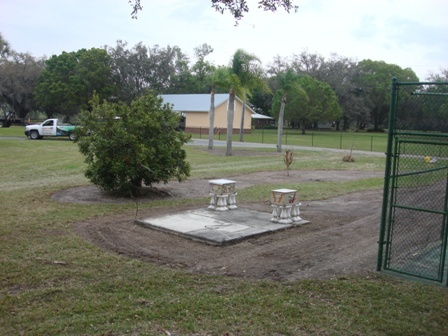 We’re going to add a few stepping-stones, a few Adirondack chairs and a picnic table to complete our project. Our plan is to spend the summer having a daily tea party and a picnic in our “mariposa garden” while we wait for our flying visitors.